With the 2017 NHL Draft having finally concluded after months of analyzing and comparing prospects, we can now begin to study those picks. It’s no secret that late-round picks have a very slim shot at developing into full-time NHL players, let alone stars in the league, but it’s also not impossible. Draft picks like Brett Hull, Doug Gilmour, Pavel Datsyuk, Luc Robitaille, and Dominik Hasek, to name just a few, have teams paying special attention to who is still available as picks get into the 200s. The 2017 NHL Draft will be no different, and it’s virtually a guarantee that some player drafted after the fifth round will shock the hockey world and turn into a superstar. With that said, let’s get an early look at who some of those potential candidates may be. Listed below are the top five potential steals of the 2017 NHL Draft. A third overall pick in the 2016 CHL Import Draft by Baie-Comeau Drakkar, Ivan Chekhovich made an immediate impact upon his arrival in Canada. Looked upon as a potential top prospect as a result of his import draft status, Chekhovich flourished under the spotlight and was projected to be a late-second or third-round pick as draft day approached. By year’s end, Chekhovich had racked up 26 goals and 59 points over 60 games in the QMJHL. On a not-so-spectacular Drakkar team, Chekhovich was the leader in goals, points, and dangerous shots, with 99. He was also a standout for Russia at the World Junior U18 Championships, scoring five goals and nine points in seven games. His ability to quickly accelerate and drive the play up ice makes Chekhovich a dynamic scoring winger. Along with great top speeds, he is an elusive skater who loves to cut in and out, keeping his opponents on their toes. While his shot won’t blow anyone away, his release is quick enough to create dangerous opportunities. While a sometimes lacklustre compete level and a 5-foot-10 frame may be the reason for his slide on draft day, there’s no doubt that the Sharks believe they got a potential 20-goal scorer with the sixth-to-last pick of the draft. Chekhovich will return to Baie-Comeau of the QMJHL for the 2017-18 season. 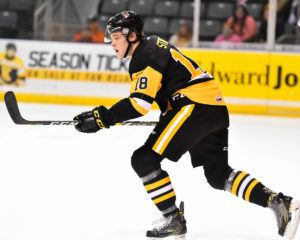 A 10th overall pick by the Sarnia Sting in the 2015 OHL Draft, Chmelevski was a crucial part of a blockbuster trade deadline deal that saw him and a haul of draft picks shipped to the Ottawa 67’s in return for Travis Konecny. Chmelevski took some time to adjust to his new team, but continued to impress with loads of skill, and was a projected third-round pick by most outlets. Through some major ups and downs of the season, Chmelevski finished the year with 21 goals and 43 points in 58 games, ranking fourth on his team in both categories. However, he did light up the Ivan Hlinka Memorial tournament, potting four goals and nine points in just four games. Expected to have a major breakout season in the OHL, Chmelevski was unable to provide the offence expected of him. Regardless, he possesses an electric shot that he can get off in tight spaces. His playmaking skills are also exceptional, creating time and space for teammates with ease. Skating is no issue either. With an explosive jump, Chmelevski has separating speed. Standing at 6 feet and 190 pounds, Chmelevki’s offensive output seemed to be his weak point on draft day. While tremendous in the faceoff circle, winning 55.3 percent of draws, he is not looked at as a two-way forward, meaning there is extra emphasis put on his production rates. In the end, San Jose picked up yet another low-risk, high-reward prospect in the very late stages of the draft. A 6-foot-4, 198-pound native of Praha, Czech Republic, Ostap Safin spent the majority of his season with the HC Sparta Praha U20 team. In a league with slightly older and stronger opponents, Safin fit in and became a difference maker for his team. He was predicted to be a second- or early third-round pick. In 24 games with the U20 team, Safin scored six goals and 18 points. He was also able to earn eight games in the top Czech league, where he added two points. Internationally, Safin gave reason to watch, potting four points in five games at the World Junior U18 Championships, as well as four points in four games at the Ivan Hlinka Memorial Tournament. Safin offers tremendous offensive abilities, led by his speed and puck-handling skills at top speeds. His shot is very accurate from below the dots, but he is also a slick playmaker, firing passes through traffic on the tape. He uses his large frame to engage physically, and displays strong vision of the ice in the defensive zone, using his stick and feet to intercept passes. Safin is a lanky kid still, and some scouts found faults in his lower-body strength, although that will likely come with maturation. Other than that, there are no major flaws in Safin’s game, making his fall of two rounds very odd. But hey, as Safin fills out and gains experience, that will be the league’s loss and Edmonton’s gain. The youngest of three Strome bothers, Matthew is also the biggest, standing at 6-foot-3 and 201 pounds. Following in the footsteps of two OHL superstars, Matthew immediately had insane expectations placed upon him entering his draft year. Originally dubbed a top-10 NHL prospect, Strome fell to a projected late second or early third-round pick. Strome’s game grew leaps and bounds this year, bumping his goals up from 16 to 34, and points up from 38 to 62. He established himself as a dynamic goal scorer, though his play as a second-line center at the World U18’s and Ivan Hlinka Memorial Tournament did not boost his rankings. Perhaps the strongest two-way game of all three Stromes, Matthew is very effective on both the power play and the penalty kill. He has a strong hockey IQ and can read developing plays on the fly. He has a strong shot and an excellent net-front presence as well. Strome is strong enough to protect the puck and drive into the slot with authority. However, where Strome’s game is held up is with his skating. He has a choppy stride and a slow first three steps. Ultimately, that is where scouts had trouble forecasting an NHL future, and why Strome fell two rounds into the hands of the Flyers. If he can figure out his skating ability, Strome could prove to be a gift as a 106th overall selection. 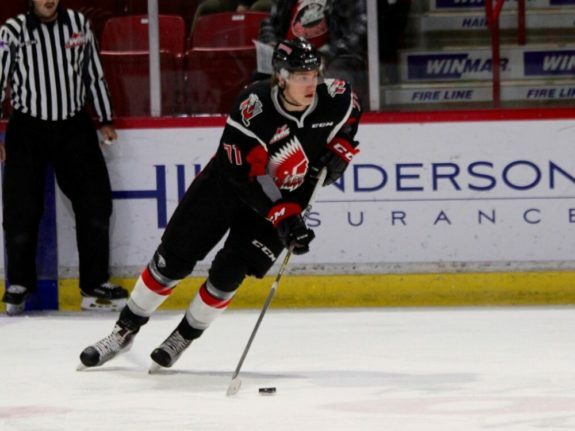 Nikita Popugaev came to the CHL in 2015 as a first round pick of the Moose Jaw Warriors in the CHL Import Draft. Following a successful 2015-16 season, Popugaev was ranked as a can’t miss prospect. However, his pace slowed down in late ’16-17 and his rankings fell to that of a second rounder. In his first 40 games with Moose Jaw, Popugaev was lighting it up with 22 goals and 51 points. He was then traded to the Prince George Cougars in January, where he was unable to replicate his first half pace, finishing the year with 29 goals and 69 points over 71 games. At 6-foot-6 and 205 pounds, Popugaev is known as a natural goal-scorer who has a drive for the tough areas. He possesses a thundering shot and can handle the puck at top speeds. He uses his edges well to maneuver through the neutral zone. Surprisingly, he isn’t an overly physical player despite his massive size and display of strength when protecting the puck. In the end, Popugaev’s second-half play had scouts second guessing his true abilities. He is a one-way player, meaning his offensive production makes up the majority of his contributions. As Popugaev began to fall in the draft, his natural talents became harder to pass up on. In the end, the Devils picked a player with tremendous upside in the fourth round, and now, a chip on his shoulder.